Breaking news: the 2018 Jeep Wrangler looks like... a Jeep Wrangler! 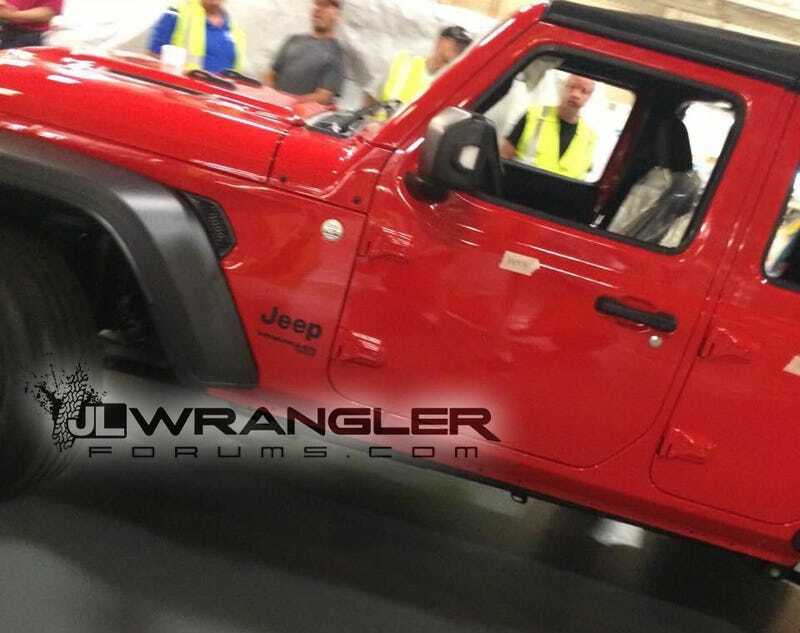 This should surprise literally no one, but it’s now confirmed in what appears to be a shot of the new “JLU” Wrangler at Jeep’s Toledo plant. It comes to us by way of our friends at the JL Wrangler forums. Honestly, the casual observer would be hard-pressed to tell the difference between this new Wrangler and the outgoing one, but that’s kind of the whole point. Nobody wanted Jeep to screw with the Wrangler’s boxy, rugged, iconic looks, to turn it into a goofy soft-roader. It is what it’s supposed to be. But the car does ride on an entirely new platform and uses some brand new engines. It’s also set to have a nicer interior, too. Many of the visible features and design changes reflected in our renderings and the official leaked images are shown here including a vent above the wheel well (albeit smaller than predicted), redesigned body-colored door hinges, buttonless door pull-handle, a body character line reminiscent of the TJ Wrangler running the length of the vehicle, higher mounted side windows, vented hood with redesigned hood bumpers for the folding windshield — the latter which is interesting given that this appears to be a Sport model. This vehicle has a black canvas soft top and black fender flares (which we know from our dealer options screenshot to be returning as options) that appear to be made of higher quality plastic with a more polished finish than that of the current generation JK/JKU Wrangler. It’s a Wrangler! They didn’t mess it up. Good news.